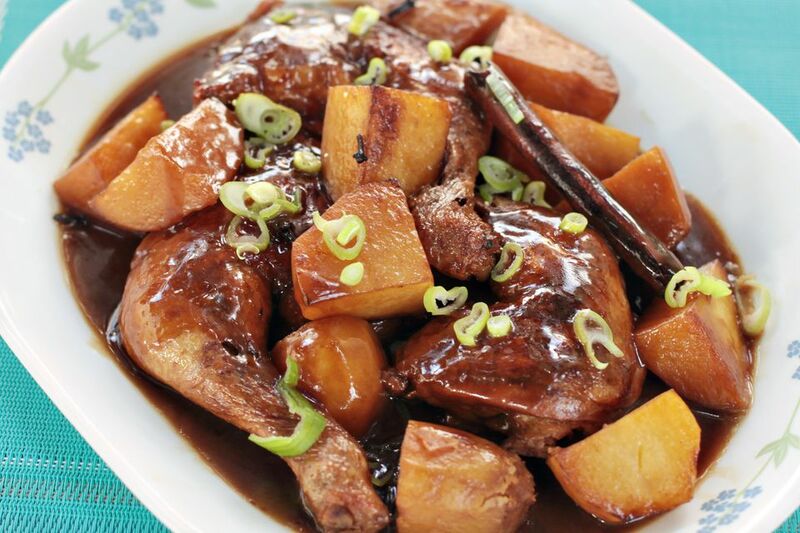 In the book Classic Recipes, Tastes & Traditions of Malaysia & Singapore by Ghillie Basan and Terry Tan (Lorenz Books, UK, 2008), there is a recipe called Eurasian chicken stew with potatoes that seemed curiously un-Asian. Chicken and potatoes are browned in oil, water is poured in, Worcestershire sauce and soy sauce in equal parts are added along with cinnamon bark and cloves. Everything is simmered together until the chicken is done. The sauce is thickened with starch before serving. I had to check if Worcestershire sauce was already in existence during the 16th century. It was although the name would come two centuries later when Lea & Perrins started selling it commercially. It's forefather, the garum has been around since Roman times. I wondered if the ancestor of the Eurasian chicken stew was Ayam pong teh (Nyonya-style braised chicken with potatoes) and the bean paste was substituted with Worcestershire sauce to suit the Continental palate. It's almost impossible to guess. With the book pointedly saying that the Eurasian chicken stew is not served in restaurants, even after eating to my heart's delight in Kuala Lumpur and Penang, it is still difficult to contextualize the Eurasian chicken stew. Still and all, the difficulty in finding corroboration for the dish's history and establishing its authenticity are not good reasons not to try this dish. After all, it is good -- very good -- just don't expect it to taste the way most Malaysian dishes do. Peel the potatoes and cut into quarters. In a wok or frying pan, heat the cooking oil to smoking point. Add the potatoes and fry until the edges are browned. Scoop out and set aside. Add the chicken leg quarters, skin side down and in a single layer, to the hot oil. Cook over high heat without moving them until the skin is golden brown. Flip them over and fry to brown the opposite side. Add the browned potatoes to the pan. Pour in the Worcestershire and soy sauces, and about a cup of water. Throw in the cinnamon bark and cloves. Bring to the boil, lower the heat, cover tightly and simmer for about 30 minutes. Taste the sauce occasionally and add salt, as needed. Scoop out the chicken and potatoes and transfer to a serving platter. Disperse the starch in about two tablespoonfuls of water and pour into the sauce in the pan. Cook over medium heat for about five minutes until the sauce is thick and no longer leaves a starchy sensation in the mouth. Pour the sauce over the chicken and potatoes before serving.